Some redevelopment of larger sites took place before WWII. 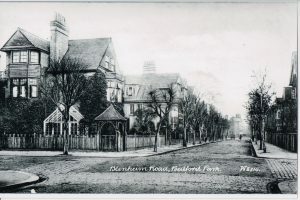 The first was as early as 1904-1906, when the run-down and unwanted Georgian Sydney House in the angle between The Avenue and Woodstock Road was replaced by a block of mansion flats. 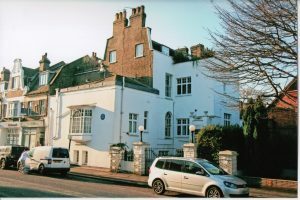 (The house, along with Melbourne House, had never belonged to Jonathan Carr.) In 1922, Agnes Fulton, mother-in-law of Jonathan Thomas Carr, who had survived both him and his wife, her daughter, died, bringing her life tenancy of Bedford House to an end. 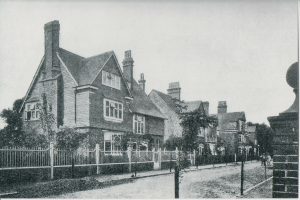 The site was redeveloped with Bedford Corner, whose story is taken up on page 5. The late 1930s saw another phase of redevelopment, soon brought to an end by WWII. 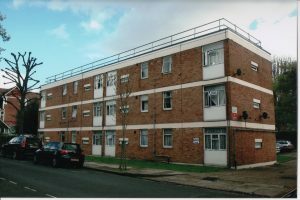 Blocks of flats were built on the combined site of Jonathan Carr’s own Tower House in Bedford Road and its neighbour 5 Newton Grove; and on the site of 38 The Avenue (Ormsby Lodge), whose original garden had been extended to Blandford Road in late 1896. 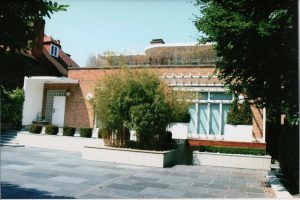 2 South Parade was replaced by an admittedly handsome modern house, and houses on Bath Road, which had been rather attractively laid out, were demolished to make way for an extension of Chiswick Polytechnic, the successor to Jonathan Carr’s Chiswick School of Art. Click on the photograph to enlarge it and move to the next one. 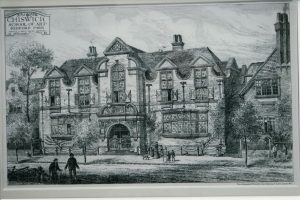 Tower House (centre) and part of 5 Newton Grove (right) as depicted by Manfred Trautschold in a lithograph of 1882. When conditions eased by the late 1950s, redevelopments again began to be made. 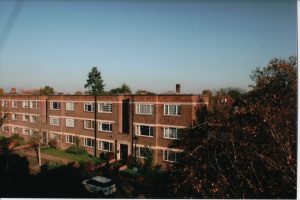 By this time, some people, notably John Betjeman and Tom Greeves, an architect who had moved into Bedford Park with his architect wife Eleanor in 1951, became concerned that Bedford Park, by then widely recognised as the first garden suburb, was in danger of losing its character, and that efforts should be made to save it from further deterioration, particularly by listing the houses. Bedford Park, although scarred, had lost only three buildings to war damage. 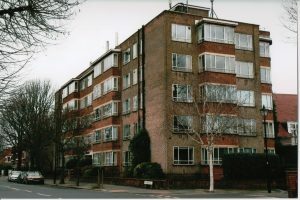 13 Queen Anne’s Grove, the house in which Jonathan Thomas Carr died, was replaced by an unobtrusive red brick block of local authority flats. 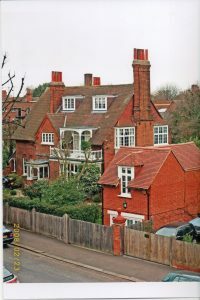 9 Blenheim Road was replaced by a modern house which itself was replaced by a Bedford Park replica house in 2005-2007, and is featured on Page 3. 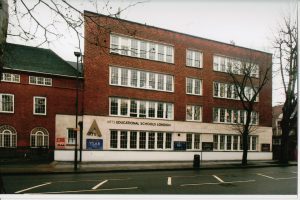 Maurice B Adams’s Chiswick School of Art was destroyed by a flying bomb and replaced by a plain brick block. 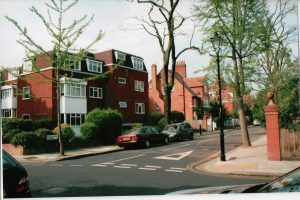 A turning point was reached in 1963, when local indignation was triggered by the replacement of a run-down large house at 13 Bedford Road by a five-storey block of old people’s flats whose incongruity was emphasised by building it in a bright yellow brick. This event stimulated Harry Taylor, a retired builder active in local politics, to call publicly for a Bedford Park Preservation Society to be formed. 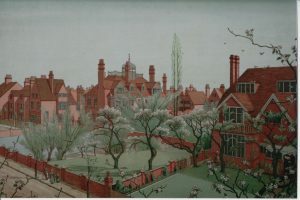 Tom Greeves, who had had the same thought but had not pursued it, made common cause with Taylor, and his knowledge combined with Taylor’s political ability and connections, supported by encouragement and advice from John Betjeman, resulted in the formation of the Bedford Park Society that year. 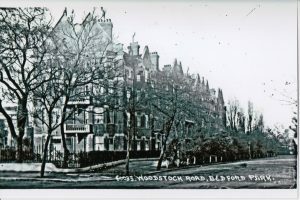 The Society, which was joined by recent, mainly young, arrivals in Bedford Park who could appreciate its potential, continued to campaign for listing of the houses, initially meeting with an unsympathetic and even uncomprehending response from the relevant branch of government. There were, however, some successes in the period before listing. 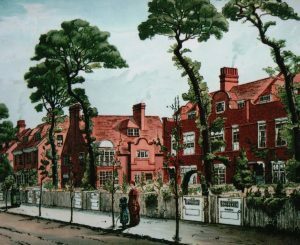 A proposed redevelopment of 3 Newton Grove was refused in 1963, as was a 1965 proposal to demolish Bedford House and replace it with four more shops and a block of flats. 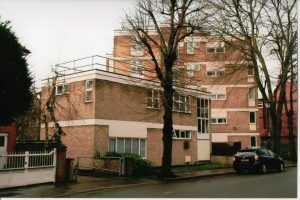 Although the redevelopment of 1 Marlborough Crescent went ahead in 1965, the resulting block of flats was sympathetically designed for a housing association with Greeves’s advice. Rather less successfully, the redevelopment of 5 The Orchard, which had been the subject of a compulsory purchase order by the local authority in 1956 was enforced when the elderly owner died in 1963. 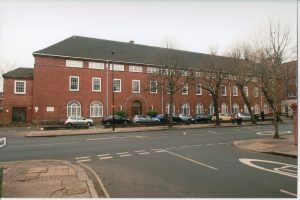 The new building was of only three storeys and was supposed to be in red brick, although the colour chosen was more of a pink shade.